I use LED bulbs in my home as they are more cost effective. The warm light from incandescent bulbs are available in LEDs. This link goes into detail about LEDs and light bulbs in general. Sufficed to say that you can save money using LED bulbs. The question I am answering in this article is whether or not you can save money with a bulb that you can turn on and off via WiFi. In short, in the case I tried, the answer is yes. I won’t keep you hanging, but I will go into much more detail with my post. I should add that I will speak about specific brands but that there are no affiliate links here. I just bought these bulbs for my own use, and I will just explain my experience with my own usage. A 60 watt incandescent bulb uses 60 watts of power each second and puts out about 800 lumens of light. A LED can put out that much light with 6 to 12 watts of power. So that’s better. Some folks find the blue light that they put out off putting and harsh, but for the last few years, you have been able to get quality LEDs that put out light in the warm color range that incandescants have put out for over 100 years. Warm light is generally defined as 2700k to 3500k light. I found a link here that goes into the light color by temperature, and this can be helpful if you have been unhappy with LED bulbs you have purchased in the past. I have been using them for a long time, and have both cold and warm light in my home. I prefer cold light in work spaces like my garage and basement, and warm light in the living spaces. I own a Kill-A-Watt meter that I have had for more than 20 years. It’s a great tool to help you find energy leaks in your home. As energy prices continue to increase, it can help you decide if it’s worth it to upgrade that refridgerator, that lamp, and those energy eating devices like cable boxes. My old cable box, for instance, did not use any less energy when it was “off” than when it was “on”. I am glad we cut the cord, but I digress. My home is dark. there are no streetlights in my town except for the town center and sections of my main road. My garage faces the front of my house and I have 2 flood lights there on a motion sensor. That’s great, but they don’t shed light on my front door. In the winter, or when we get home late in the summer, there is no way we can have light on our front door without leaving that light on all day. I am not a fan of that. I feel like it says, “Hey, we’re not home, and won’t be until after dark.” Granted I live in a safe area, and my neighbors and I all watch out for one another. Still, it’s just how my mind works. Besides, fumbling to find the correct key in the dark drives me up a wall. Some time ago, I replaced the dead incandescent bulb in my porch light with a LED from Cree. I like the quality of their bulbs, and I have purchased many for my home. Going from 60w to 8w does save money when your generation plus delivery costs for your electricity are above 20 cents per KWH. I am including taxes, delivery charges, and the link in that. Generation alone is about 10 cents per KWH. The question I had was, excluding the cost of the bulb, was it cost effective to switch to a LED bulb that I can control over WiFi. I like Anker as a manufacturer, and have owned many of their products, so I decided to buy their EuFy sub branded products. For $25 I got a 800 lumen, 60 watt equivalent, bulb that I can turn on and off with my phone. the setup took me all of about 5 minutes, and I was turning on and turning off my porch light from my phone. This assumes that the switch is in the on position, but I think the family can get used to that. What I was wondering, though was how much energy the bulb uses when it’s on and providing light versus when it’s off, and waiting to be told to turn on. I plugged my Kill-a-Watt meter into an outlet, and plugged a simple light into it. I placed my old Cree bulb into my lamp, and checked the power use when the light was switched on, and off. when the switch is off, obviously, there was no power, and there was the rated 8 watt drain when the light was on. Next, I switched out the bulbs, and tested the EuFy bulb when it was on and off, but the switch from the lamp was in the on position. I was surprised to find that the bulb only drew 6 watts when it was on, and 0 when it was off and on wifi only. Now to be clear, my meter only measures down to 10 milli-amps and single digit watts. So the drain has to be below 10 milli-amps and below a single watt. Obviously, since I was turning on and off the light multiple times from my phone, there has to be some draw, but it was exceptionally low. What I proved in this test is that the EuFy bulb uses less power than the Cree when on, and too little power to measure when in the “off” setting. This means that I can feel comfortable that I am not wasting power with my porch light being a WiFi light. I did not measure lumens coming from each bulb. I don’t have the need for such a meter as much as it would be fun to test in this case. I will have to trust the manufacturer. 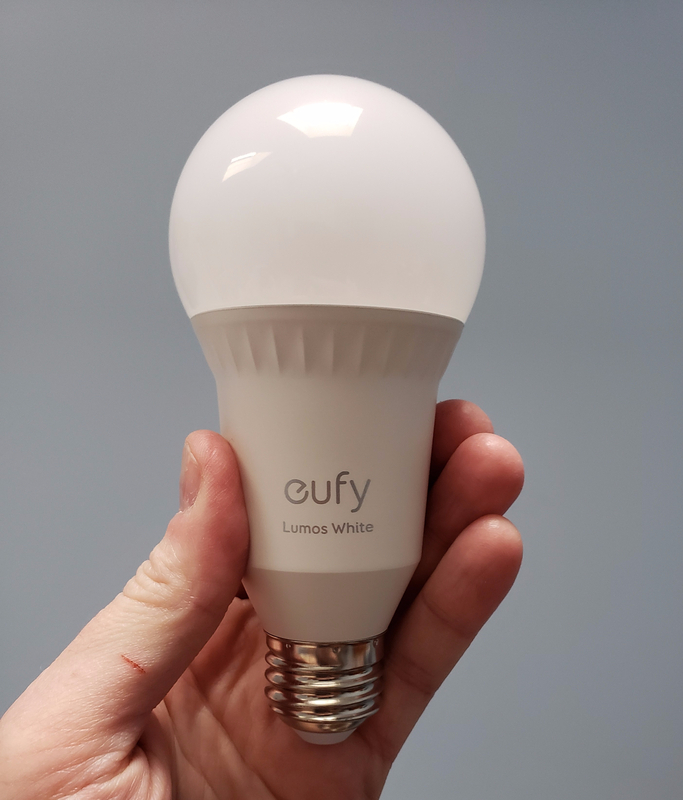 The EuFy bulb does say it draws 8 watts when giving light, so it may be giving less light, or it burns more light energy when it’s been on for a while. I like being able to sit in my car in my driveway and then turning on that light. That makes my life easier, and it will save me frustration. The two lights use basically the same amount of power when giving light, so I can’t see how this will save money. Nevertheless, this change is valuable to me, and improves my life. There is the value. I will not replace all the light bulbs in my house with a $25 light bulb, when regular LEDs are available for $2.5 or less for the 800 lumen 60 watt equivalent bulbs that I like so much. Even 100 watt equivalent LED bulbs are available for only $4. The one bulb is valuable to me in that one place. There are many cases of people hacking WiFi cameras. I read another story this past week. While I would find it useful, I will not buy one for my home. I may buy a Ring or a competitors video door bell if ever my area has issues with package theft. Many of those internal cameras have been found to have been listening to voice and storing video when they are supposed to be off. I feel the same way about Amazon’s Alexa and the competing products. For me, I am not worried about the NSA listening to my conversations. I know they don’t care about average people. Google, Amazon, and the rest do care about the average person because they will use what you say and do for advertising. I know many people who have mentioned a product while Alexa was listening, only to find the ads in their browser change to that product. This isn’t really a big deal, but I don’t like it much. Even with my phone, I only enable the voice search with a button press. So no Alexa for me, and no cameras for me. I will likely buy a few wifi outlets to control my outside lights during the holiday season and one or two other outlets in the home. What I do like about the option I chose is a couple of things. For one, I do not need to run a hub. That’s a waste of power and of setup. The other thing is that if I ever change my mind on the whole Alexa thing, these products are setup to work with them. I freely admit that while I am uncomfortable with the concept of Amazon or Google listening to everything in my home, I may not always feel that way. I live in Canada and I have done the complete led conversion. The problem I have is that all of the fixed utility charges are eating all of my savings on both electricity and natural gas. One of my recent bills was $63, about $ 7 in actual energy charges, the rest in mostly fixed costs not tied to consumption. this is here way more and more utilities are going, don’t use anything and still have a sizable bill. And sorry but in a northern climate you cannot completely disconnect from the utility without significant risk. We are not fully LED yet. As the incandescent bulbs burn out we replace them with the LEDs. Wow on the disparity between energy costs and the fixed costs. For me here in the NY suburbs, it’s not quite that bad. We pay about 60% of our bill for fixed costs with our cost per KWH for generation alone being about 9 cents. There are fees for each delivered KWH, and so on, but there you go. I think that is what they are doing in most places. Disconnecting from the grid is a big deal, and a risky one. The only way I would do it is if I had enough water flowing through my property to setup a micro hydro setup that could reliably generate power 24/7 since there is no battery technology that can store enough power long enough for most people. I suspect in a desert where rain is rare, you could have enough battery at a reasonable cost for that scenario. In our case, not only are we grid connected, but we also have an emergency gas powered generator. It was quite useful when Hurricane Sandy knocked out power for 8 days for our street. We’ve used it on average for about 4 total days a year, many in the winter, and like you said, you can;t be without power in the cold. In our case, we are also on well, so no power means no water as well. That’s not okay when you have a kid!.